Common Name: Polygala root, Thinleaf milkwort root. Part Used & Method for Pharmaceutical Preparations: The roots are dug in spring or autumn. After the fibrous roots have been removed, the roots are cleaned in water and dried in the sun. Functions: 1. To calm the heart and soothe the mind; 2. To resolve phlegm and clear the orifices (sense organs). 1. Insomnia and forgetfulness. 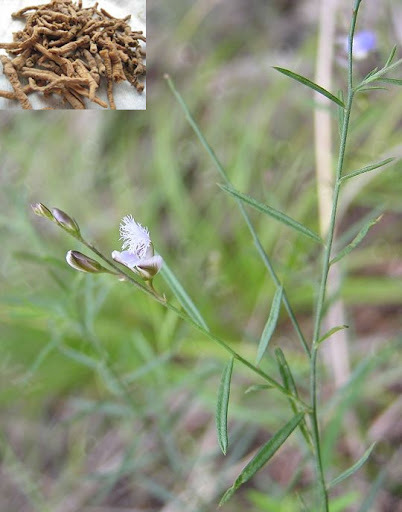 Polygala root (Yuanzhi) is used with Ginseng (Renshen) and Grass-leaved sweetflag (Shichangpu) in the formula Buwang San. 2. Palpitations and restlessness. Polygala root (Yuanzhi) is used with Wild jujube seed (Suanzaoren) and Dragon's bone (Longgu). 3. Turbid phlegm disturbing the heart manifested as mental disorders and unconsciousness. Polygala root (Yuanzhi) is used with Grassleaved sweetflag (Shichangpu) and Curcuma root (Yujin). 4. Cough with excessive thick sputum or sputum that is difficult to expectorate. Polygala root (Yuanzhi) is used with Apricot seed (Xingren), Platycodon root (Jiegeng) and Licorice root (Gancao). 5. For carbuncles and other skin infections and for painful breast swelling, its powder can be taken alone or with yellow rice wine, or mixed with rice wine for external application. Dosage: 3-10 g, decocted in water for an oral dose. Proper amount for external use. Cautions & Contraindications: Use cautiously in patients with peptic ulcers and gastritis.